Some great tales from Lindsay from the Sea of Galilee and NYC marathons! Bottom of the page. This page has a straightforward purpose: to share stories and incidents that Scotland’s endurance athletes, teams and coaches have experienced in the course of their athletic carers. Given the amount of travelling, the number of miles covered in training and racing, given the rather broad range of competitors and ‘hingers-oan’ then these tales are legion. Send in your own and we’ll add them to the page. For example, if you want the humorous anecdote, there is the story of a runner in the West District cross-country relays at King’s Park, Stirling, who while running in third place hurdled a barbed-wire fence near the end of the race. Unfortunately he caught his under-carriage (I hesitate to refer to them as ‘crown jewels) on the fence. One of the runners beside him at the time said, “You should have heard the language he used – and he’s a BB officer tae!” Barbed-wire and male appendages feature in several such tales – the one about the runner who caught the latter on the former in the County Championships and was taken to the hospital A&E Department where he was received by the woman doctor but he refused to tell her what was wrong – too embarrassed – but fortunately he was accompanied by a less squeamish club official and he just had to grin and bear it! Then there are the stories about particular incidents during races – the chap who was knocked down in the Edinburgh to Glasgow and immediately picked up and taken into a house at the roadside from which he escaped through the window to carry on with his leg of the race. The National used to be held at Hamilton race course and most times consisted of a long straight with a huge loop at one end with a massive hill involved and a small perfectly flat loop at the other end. One runner was caught stopping at the start of the small loop (just before actually turning into it) bending down to tie his shoe lace but turning through 360 degrees while doing it so that he was facing back the way he was going and trotting off to continue the race having gained 20 or 30 places and had a wee breather into the bargain. I’ll start with some already contained in the website and use one from the Maryhill Ladies AC page about the time when a young PE teacher called John Anderson was taking four girls down to the British cross-country championships in the early 1960’s. They travelled in a dormobile type vehicle and after they had set out it started snowing and the snow got thick and it became evident that they would have to pull over and spend the night in a lay-by. No motorways and no service stations at that time. John, beingan enthusiastic type, let the women have the inside of the van and he said he would take his sleeping bag and spend the night under the vehicle. It wasn’t a good idea and eventually he had to knock on the door and ask if he could get inside the van. Far from being in PJ’s or anything, the runners were all in overcoats, it was so cold Eventually they all dozed off for a couple of hours or so. In the morning Leslie Watson and Cathy Kelly jogged off for help and came back with a tractor and the van was towed clear and they set off for the championship. Eagle-eyed John saw a cinema with a queue outside it. He immediately decided that they were going to the pictures! He disabused them of the notion that they were going to see the film: the walls of the cinema would be lined with heaters and they were only going in long enough to be properly warmed through. He paid for them to get in, they warmed up and then back into the van and off to the race where they acquitted themselves nobly! Hugh Barrow has another John Anderson tale. In his own words, “I remember sitting in the middle of a packed mini bus driven by John Anderson heading over Shap towards RAFCosford in the 60s. In the front as ballast Doug Edmunds, in the back for music Moira Kerr, also The likes of Dunky Middleton and Hamish Telfer I think. John never known for his conservative driving had the foot to the metal and this was making big Doug nervous. As John took the shortest route round a blind bend Doug asked him what would happen if we met his brother coming in the other direction– to which John answered it would be ok as he would also be on the wrong side of the road. 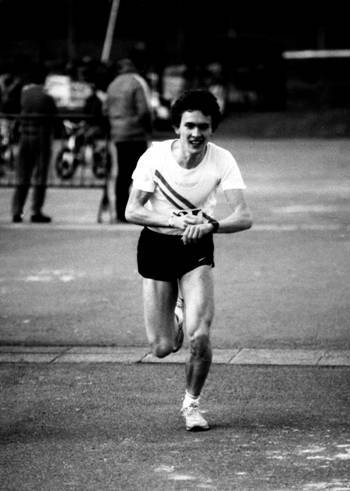 Alistair Lawson: Alistair was a good runner who for a time was a member of Dumbarton AAC and ran in the Glasgow to Fort William Relays in the 60’s and 70’s. He travelled the world climbing in the Drakensbers, the Andes and various other mountain ranges and is a committee member of the Scottish Rights of Way Society. Once upon a time, when the world was still young, I was with a bunch of hikers up in the Peruvian Andes. We were making our way into the heart of the mountains by following a “quebrada” (= glen, in Scotland). The floor of this glen was around 13,000 feet above sea level, though we were still very much at the foot of the amazingly high surrounding mountains. During the day, a couple of members of the party, who were suffering from the altitude, had dropped further and further back and, by the time we were thinking of stopping and setting up camp, had not been seen for some time. The rest of us felt someone should go back and accompany them the rest of the way, and, as I was known to be a runner, I was “volunteered”. Going down the glen seemed, of course, as though it should be a dawdle, so off I went at a modest jog. Within half a mile, I was puggled, short of breath, gasping, and the oxygen-starved leg muscles were ready for a walk. The moral of the story? “Altitude beats Attitude”. Needless to say, I have been puggled on many other occasions, before and since, most of them at sea level, in Scotland, with the benefit of 100% atmospheric pressure. Well, there you go. Jim Russell sent this one about the Edinburgh to Glasgow. I remember one of the trial runs for the 1970 Commonwealth Games marathon when Bobby Lochead of Springburn was looking for some diluting orange juice to make up his bottles for the race. At that time the runners in the SAAA Marathon could provide their own bottles of drink and write the stations at which they wanted them left. The usual practice was to make up a pint of concentrated orange juice with water, add a tablespoon of sugar and a teaspoon of salt. Bobby was a qualified so when he came back with lime juice saying he couldn’t get orange but the main thing was ‘the sodium ions’ I didn’t argue. The first mouthful he got during the race was spat out – it tasted foul apparently! So much for chemistry and marathons. Another from Hugh Barrow: “On a beautiful sunny March afternoon in the late 60s the VPAAC Cross Country Championship was taking place over the traditional course in Milngavie. As the field meandered over the fields near Milngavie Golf Club they had to traverse several stone dykes where behind one a romantic couple were making the best of the good conditions. Such was the endeavour of the runners they didn’t break stride as they vaulted the dyke and the couple — and such was the intensity of the moment, neither did they”. We used to go warm weather training in the early and mid 90’s, usually to Alfa Mar. One year we had arrived and were in the front of the hotel when Ewan saw this guy and recognised him immediately as world record holder Wilson Kipketer. He went over and asked if he could get his photograph taken with him and Kipketer obliged. It turned out that he was there n his own with his coach and he started to talk to the guys regularly and became quite friendly. I was only there for ten days although the squad were there for a fortnight and the night before I left I was packing bags when two of the group came to the door and invited me down for a drink. We went down and joined the whole group at the table and there was Wilson K sitting next to an empty chair which I grabbed. he wasn’t drinking so I just offered to get something for him, to which he replied, after reaching to a distant ash tray and picking up a fag end, “Not until I have finished my cigarette.” A wee bit later and the conversation died down to be ended by Mark saying to the world record holder, “Have you heard of Cambuslang Harriers?” He was, I am sure, joking, but he was given a bawling out just the same. Now one of the best tales I’ve heard for a long time come from Mel Edwards who sends this one. “One of the most exciting and satisfying days of my life was back in October 1967. I had just won my debut marathon in Harlow, Essex in 2.18.24 which was a course record and would place me 4th in the UK rankings for the year, and was heading for the train to Liverpool Street en route to Southampton where I was working at the time. The train was packed except for one carriage which had a solitary occupant who was staring gloomily out of the window, chin on hand. I think this is what put passengers off selecting this one because every other one was full. So I bit the bullet and entered to be met with a glower. I sat down and read my AW. Finished it and decided to say something. “Been up to much today?” Response, with a gloomy look “I’ve just done a marathon”. “Oh” I said “I did that one as well. How did you get on?” Reply “ I was last”. Back to the window, chin on hand. I thought, what a blooming shame. You’ve run 26 miles and you’re depressed. Then I had a brainwave. “What position were you?” “Last, I told you”. “No” I said “What actual position were you? They posted the results on the board” “98th…last” I thought “Got you!” “Do you remember Tom Dradey the race organiser gave us a briefing on the course on the start line?” “Yes”. “And do you remember he said he was delighted he had a record field registered and on the line of 110 runners?” His next words were “Eh, Ah, Ooh” “Yes” I said “12 dropped out. You had the guts to finish” Well, I couldn’t get him to stop talking all the way to Liverpool Street. All about his family, his work, his running. He’d had a fraught week because he was worried about the marathon AND his budgie was off it’s food! We said our farewells at Liverpool Street, and I wished him and his budgie all the best. My lasting memory of him was him going “Tsk, tsk, 12 dropped out” and raising his eyes to the heavens. Mel winning the Junior National 1963: best cross-country race I ever saw! The second one is about training nights. “Club night during winter and we’re going out for a road run. It’s cold, raining heavily and most are wearing some sort of waterproofs. I have a full waterproof tracksuit and others have waterproof jackets, but not Andy. Stating that it’s not cold he is just wearing shorts and a string vest. Then on another club night, this time during the summer, we are out in Pollock Estate (now they call it Pollok Park) and going along the side of the River Cart when we run into a swarm of midges. A few of us get some in our mouths and there is a spate of coughing and spitting to clear our throats, I even throw up. But again Andy has to be different and swallows them saying they’re pure protein! A really good one now from Lindsay Robertson (abpove) who won the Sea of Galilee Marathon twice. At the 1985 SOG, a couple of days or so before the race a guy came up to me and asked if I would like to go jogging with him the next morning. I casually checked out what sort of standard he was – I had never heard of him. ‘So, what’s your best time.’ ‘2:10’. Internal expletives!!!! The next morning we duly met before breakfast and after cheerful greetings set off for a jog. A minute later I was thinking ‘You look like you’re struggling’ so enquired again ‘What did you say your best time was again?’ ‘3:10′. Huge sigh of relief!!! Soon after a Jumbo load of people saw the film screen suddenly go blank followed shortly thereafter by the start of a completely different film! At Heathrow I just missed a shuttle to Edinburgh, but the captain of the next one turned out to be a runner I had met a couple of months previously. He had said to me if I was ever on a flight he was piloting to let him know via a stewardess. I did, and spent the rest of the flight in the cockpit. I was glad I had missed the earlier flight! And he never did get to see the stamp collection!